When the Infinix Hot S was announced two years ago, we thought the existing Infinix Hot series was going to be scrapped. It wasn't, however, as Infinix Mobility decided to keep both series running simultaneously, resulting in the Hot 5 and Hot S2 the following year. The 2018 iteration of the Hot S series, the Infinix Hot S3 has been released, and it's about time the other one levelled up. Say hello the Infinix Hot 6 Pro. 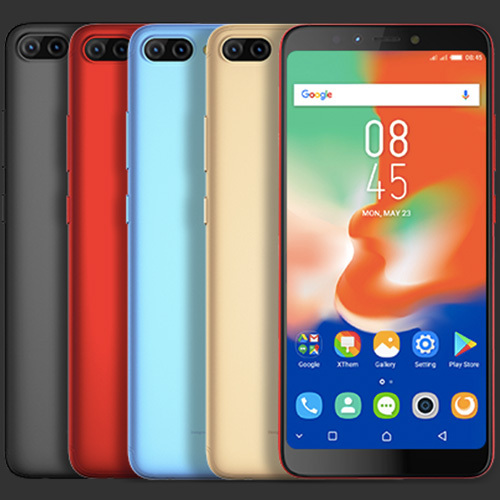 The Infinix Hot 6 Pro was launched recently alongside its standard variant, the Infinix Hot 6, and it's now available for sale in Kenya, billed to come to Nigeria and other African countries very soon. It differs from its standard variant, the Infinix Hot 6 only in the internal storage and memory capacity, and is otherwise an elegant device with an aesthetically-appealing design, decent internals and a reasonable price. The Infinix Hot 6 Pro comes with a 6-inch IPS display which uses the LCD display technology and has a resolution of 720 * 1,440 pixels (HD+). An HD+ resolution is not too good for a display that large and it should have been made at least Full HD, but it's still an improvement on the Infinix Hot 5's HD display resolution. The device follows the latest smartphone design trend and sports a metal body design with 18:9 aspect ratio, although it's not bezel-less as some other smartphones are. It sports a fingerprint scanner on the rear and weighs just 153 grammes. The Infinix Hot 6 Pro is powered by a Qualcomm Snapdragon 425 processor which can operate at a maximum speed of 1.4GHz and uses four cores (quad-core). It's assisted by an Adreno 308 GPU which handles graphics operations. The smartphone comes with 3GB of RAM for multi-tasking and 32GB of internal storage for file storage. An external microSD card with a size of up to 128GB can be inserted into the appropriate slot on the device to avail the user of extra storage space. The Infinix Hot series has always outed smartphones with large battery capacities, and that's not about to stop. The Infinix Hot 6 Pro packs a 4,000mAh battery that can last for up to two days on average use, but since the phone doesn't come with fast charging technology, it's going to take a while to get a full charge also. The Hot 6 Pro sports dual 13MP + 2MP cameras with Phase Detection Autofocus (PDAF) and a dual-tone dual LED flash on the rear. The secondary camera feels like an unnecessary addition to boost the market sales of the device considering its low quality, but on the bright side, users will be able to achieve a level of Bokeh effect on their photos. The smartphone also sports a 5MP camera with a LED flash on the front for taking selfies. The Infinix Hot 6 Pro comes with a dual nano-SIM slot and has support for 4G LTE, as expected. You'd be disappointed if you were expecting a USB Type-C port, however, as the device comes with the familiar micro-USB v2.0 port for charging and wired data transfers. The Infinix Hot 6 Pro runs on Android 8.0 Oreo out of the box with Infinix's XOS version 2.3 layered on top. 32GB Internal Memory, expandable up to 32GB via microSD. The Infinix Hot 6 Pro is currently available only in Kenya and can be purchased for Kes. 15,699 in the country. It's coming soon to Nigerian markets where it's expected to cost around N60,000.